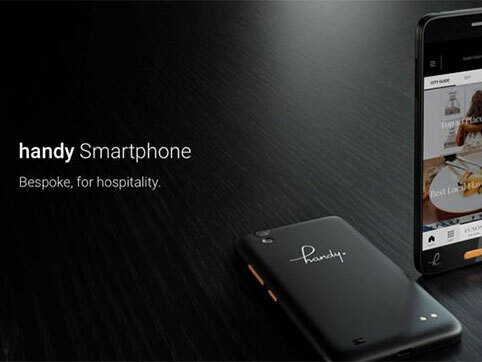 Free Smartphone to use during your stay!
" 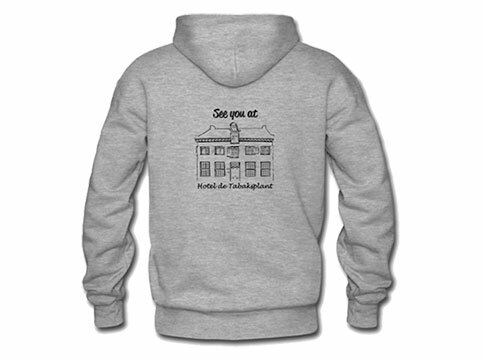 Lovely place to stay, well located and very friendly staff. I will recommend it, very good breakfast! H. Carbonnet "
" We had a amazing,great stay. Very short (one night), but charming and super caring loving people, hopefully not for the last time! Coby-Ria Apeldoorn"
" We had a lovely time! Nice room, good beds, nice breakfast, cozy and homely! The personal service was perfect! 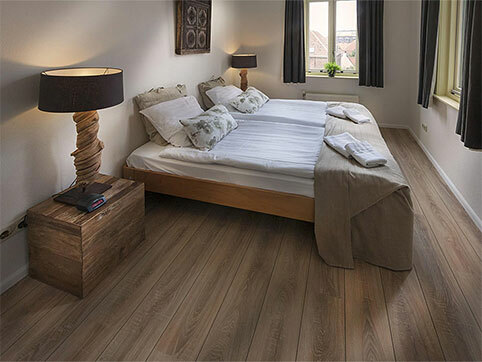 Frans and Anneke Brouwer"
" Highly recommended, quality and warmth !! Toon & Wim "
Hotel de Tabaksplant Amersfoort - Unique and one of a kind, Welcome at Hotel de Tabaksplant Amersfoort! Hotel de Tabaksplant, which means tobacco plant, is a cozy city hotel with 25 different rooms in the historic center of Amersfoort . The hotel has two meeting rooms, including six apartments for long-stay and has a large, private city garden with a medieval well and terraces . 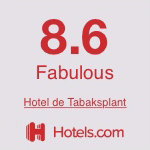 Hotel de Tabaksplant is a welcoming hotel for both business and leisure purposes. You will feel right at home. While staying at Hotel de Tabaksplant you are enjoying the best of both worlds . The historic character of the hotel is reflected in the beams of the ceilings, ancient rafters, tiled and wooden floors, original windows and traditional hospitality. Contemporary comfort you will experience by the application and use of natural materials, modern bathrooms, free wireless internet ( free WiFi ) and our boundless service and support . The staff of Hotel de Tabaksplant will do everything to make your stay as pleasant as possible. Although all rooms are different, they have in common that they all have television, comfortable chairs, a small fridge, tea and coffee facilities and guest amenities. The quiet location contributes to a good night's sleep and in the morning you get a healthy and delicious breakfast to your wishes. For our business guests, we have two stylish meeting rooms available, equipped with modern audio-visual equipment, but also luxurious chairs, a fireplace and French windows. These two areas are also suitable for other types of events such as private dining. Do you want the privacy of an apartment and the hospitality of a hotel? Then we have in the vicinity six spacious apartments for two to four people available . 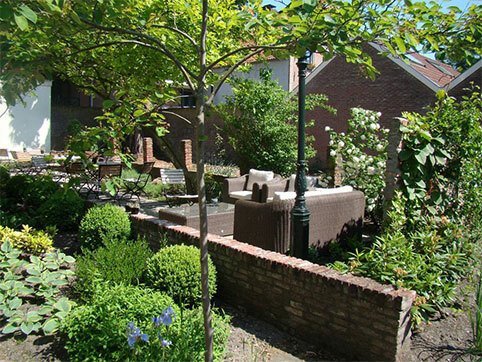 The hotel is in a quiet street in the northeastern part of the historic center of Amersfoort. This town in the middle of the Netherlands is easily accessible by car and public transport. Your car can be " around the corner " in the car park of De Flint theater. Amsterdam Airport Schiphol can be reached within an hour. 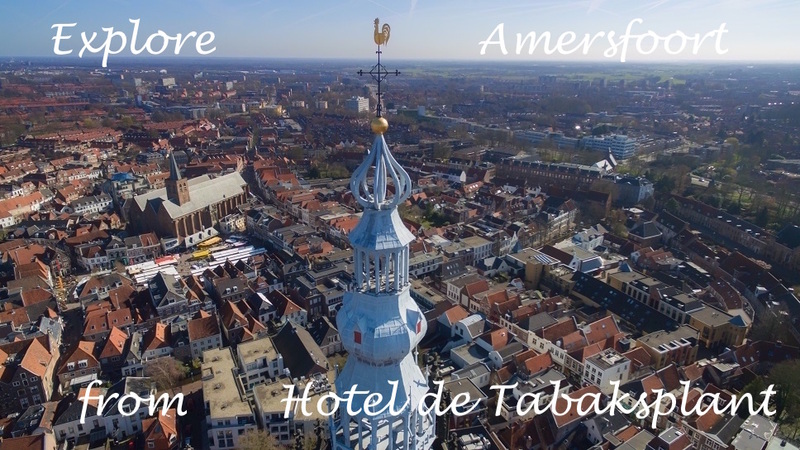 From your hotel you can walk into the center of Amersfoort, with shops, nice squares, cultural and historical monuments and a variety of restaurants. We offer airport service from Amsterdam Airport Schiphol to Amersfoort and vice versa for only €85,-- one way. We pick you up at the airport and drop you at the front door of the hotel. That's a convenient and relaxing way to start your stay at Hotel de Tabaksplant!! If you want to explore Amersfoort and its surroundings during your stay, rent a bike! The rent per day per bike is only €10,--. For periods longer than a week we have special rates. Ask at te Reception for more information or order your bike upfront by email or phone. Hotel de Tabaksplant consists of three terraced buildings in the Coninckstraat. The building at number 13 and 15 date from the 17th century. Number 17 was built in 2004 and is home to the rear, at number 19 , a beautiful gazebo. Behind these buildings is a large, walled garden with a medieval well. It derives its name from the regional tobacco trade in the 18th century. Between Nijkerk and Amersfoort tobacco was grown. Under the roof of number 15 it was dried to be processed later. In the garden house is a historic brick captured, which refers to the tobacco trade . The soil around the hotel disclosed many historical discoveries. One particular instance is a medieval cooking pot, a bronze “Graap”. You can see it in the showcase in the “Coninck Chamber”.